My name is Matthew Isteed and I am an artist studying BSc Games Modelling Animation and Effects at London Metropolitan University. As part of a work-placement with the Galapagos Conservation Trust (GCT), I have been creating some pieces based upon one of the Galapagos Islands’ most famous residents, the Galapagos giant tortoise. At the start of this project, I initially created some drawings of several species that inhabit the archipelago. My first piece was a series of sketches based on a selection of wildlife that I found particularly interesting. 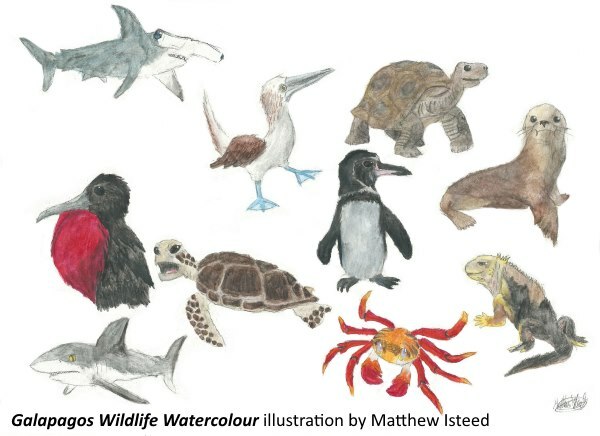 After I sketched each species in detail, I added colour with watercolour pencils. I aimed to replicate the species fairly accurately with some slight stylisation, by keeping colours bright and slightly exaggerating the heads and eyes. Starting with the Galapagos penguin, I carried out some research tracking down photographs in order to create a scale guide. I measured the animal by determining their head size (or in the scalloped hammerhead’s case, its dorsal fin) and duplicating this guide to find out how many ‘heads’ tall or long the animal is. This was inspired by a technique that cartoonists use to establish proportions. I repeated this technique a few times for accuracy, and then sketched my interpretation of the Galapagos penguin, with some slight stylisation. I chose the Galapagos penguin as penguins are one of my favourite animals. 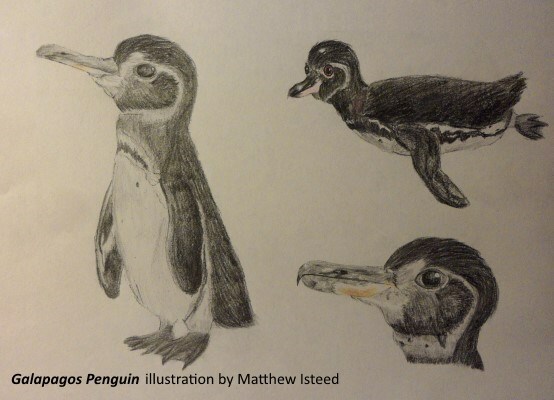 I also drew a portrait of the penguin’s head, and a sketch of a penguin swimming. These were coloured with pencils. I chose the land iguana due to its magnificently bright colour scheme. 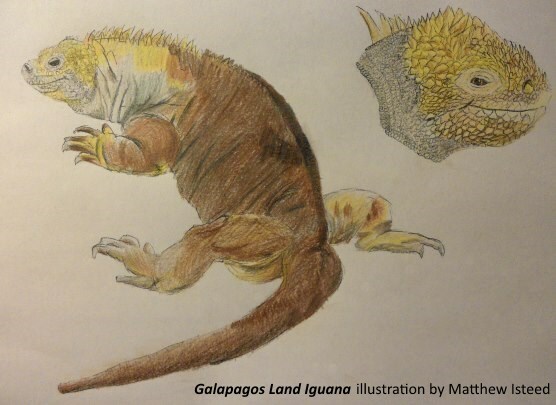 The land iguana was sketched based on my scale diagrams, drawing an illustration of the iguana resting, as well as a close up of its head. Again, these sketches were coloured with pencils. It was a challenge depicting the land iguana’s wild colour scheme, but the result works well. 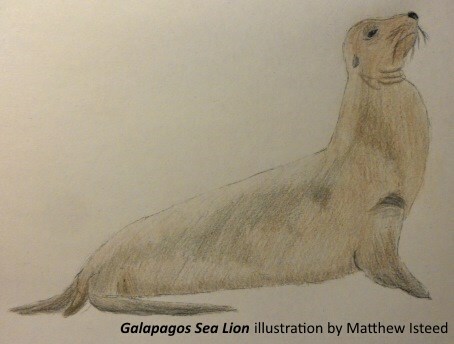 The Galapagos sea lion was another animal I researched, and I enjoyed seeing videos of their playful nature. 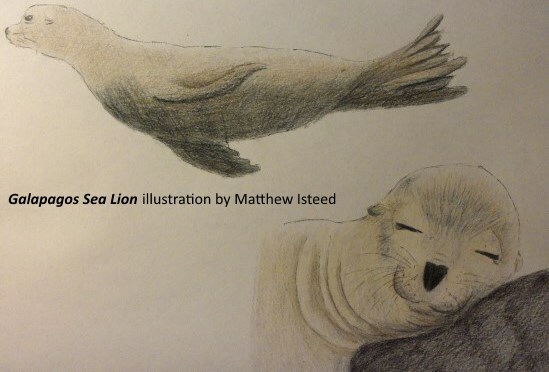 The sea lion was illustrated in the same way, based on photographic research, depicting the sea lion resting on land, swimming, and a close-up of a sleeping sea lion’s face. In the next blog post, I’ll talk about drawing Galapagos species including the blue-footed booby, the scalloped hammerhead shark and the Galapagos giant tortoise. 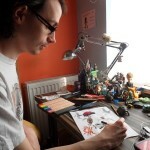 Matthew Isteed is a BSc Games Modelling Animation and Effects student at London Metropolitan University. Categories: Discovering Galapagos News, Discovering Galapagos Updates | Tags: art, drawing, illustration, wildlife of Galapagos.